Lab safety is governed by an alphabet soup of agencies, each with regulations and guidelines that affect compliance. Tracking down regulatory information isn’t always as easy as it should be, and neither is navigating cumbersome websites. Stop spending time searching for what you need and get the electronic toolkit that has it all in one place. 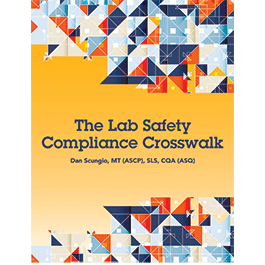 The Lab Safety Compliance Crosswalk lets hospital lab safety professionals quickly reference and compare lab safety regulations from OSHA and the College of American Pathologists (CAP) as well as other regulatory bodies to ensure their lab’s compliance. Dan Scungio, MT(ASCP), SLS, is laboratory safety officer for Sentara Healthcare, a multihospital system in the Tidewater region of Virginia. He has over 25 years of experience as a certified medical laboratory scientist, more than 10 of which were spent in the management of clinical labs, anatomical pathology labs, and collection sites. For the past nine years he has served as the laboratory safety officer for Sentara Healthcare. As a member of the Laboratory Quality Team, he oversees the safety program for more than 10 laboratories and multiple collection sites. He has a bachelor’s degree in medical technology from the State University of New York (SUNY) at Buffalo in Amherst and Buffalo, New York. For five years, Scungio mentored under the tutelage of his business partner, Terry Jo Gile, also known as “The Safety Lady®,” and he now runs his own laboratory safety consulting business. As a consultant, he has provided laboratory safety education and consulting locally, nationally, and internationally under the title of “Dan the Lab Safety Man™.” He has authored several laboratory safety articles and regularly contributes information to HCPro and the ASCP, as well as updating his website at www.danthelabsafetyman.com.